Mr Lee Swee Seng has run his HDB provision shop in Yishun Avenue 4 for 17 years, and in all that time, Madam Halimah Yacob and her family have been his loyal customers. Mr Lee, 53, sees her family members almost every day - his iEcon minimart is the closest shop for them to pick up groceries such as bread and beverages. But with his neighbour set to be Singapore's next president, Mr Lee, like many of Madam Halimah's neighbours, is feeling a mix of emotions. 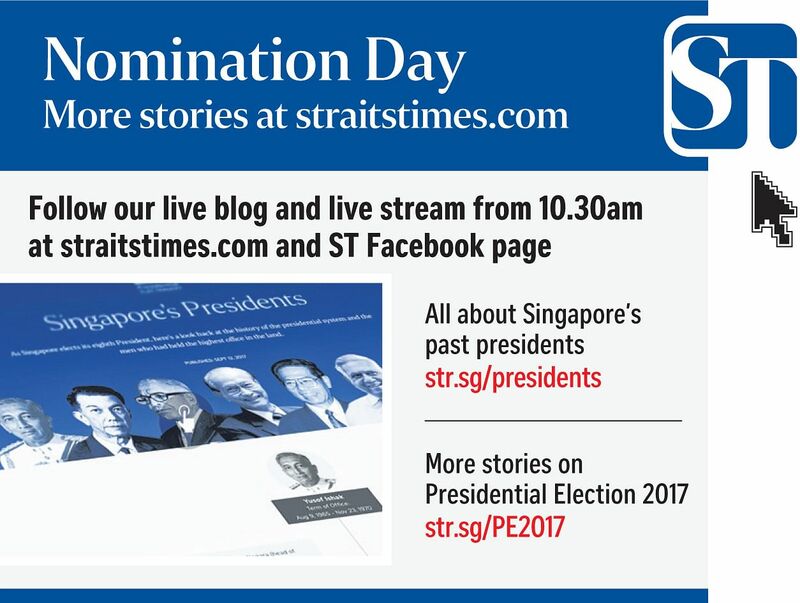 "This is very special because she will be Singapore's first woman president, and we are very proud that someone like her who lives in an HDB flat in Yishun could become president," he told The Straits Times yesterday in Mandarin. Madam Halimah's election to the highest office in the land would most probably see her move out to a more easily secured residence. The former Speaker of Parliament had said publicly that should she be elected, she intended to continue living in her HDB home. She, however, had also acknowledged that she might have to move owing to the challenges of keeping a president safe and secure in a public housing estate. For her neighbours, this would mean missing a friendly face in the lift, and warm chats in the void deck. Newspaper vendor G. Dabamani, 54, said Madam Halimah would often ask how she was doing and if she was benefiting from government policies like Workfare. "We are sad because we might not be able to see or talk to her in the lifts anymore. If she stays here, I would be so proud - my president lives in the same block as me!" said Madam Dabamani. Safety officer Henry Lim, 57, will miss seeing someone he knows as a hardworking champion of the people who has no airs. "She is very friendly, humble and down to earth. She doesn't behave like a VIP," said Mr Lim, who has lived in the estate for over 20 years. The 12-storey HDB block built in 1987 has been home to Madam Halimah, 63, and her family for more than two decades. She has lived there throughout her 16-year political career - she became an MP in 2001, was appointed Minister of State for Community Development, Youth and Sport in 2011, and elected Speaker of Parliament in 2013. Her home of two adjacent HDB flats, bought on the resale market, is nestled in a cluster of HDB blocks and tucked away in a neighbourhood that looks like any other. The corridors are cluttered with the everyday items of HDB life - bicycles, potted plants and school shoes. Apart from CCTV cameras perched on the walls near her unit, there is nothing to suggest the block houses an important leader who will be Singapore's head of state. Residents say Madam Halimah has always been low-key, and security in the area is discreet. But this might change when Madam Halimah becomes president-elect today. Last evening, policemen in plain clothes were seen stationed at the foot of her block and patrolling the area. Mr Lee said: " I would understand if she doesn't live here after becoming president... but what is special about her is whether she was an MP, Minister of State or Speaker, she was living here, among us."